Climate Action Now! teaches young people and adults about climate change by removing cement to build organic gardens in San Francisco, California. CAN!’s primary goal is to empower young people to regularly and routinely make choices that support a healthy climate. Through CAN!’s educational programming, participants learn to cultivate organic produce, make compost and build valuable wildlife habitat while conserving water and other resources. Starting with a cemented parking lot or sidewalk, CAN! partners with educational communities to remove hardscapes. After cement removal, students plant, weed and harvest from those sites, creating organically managed urban farms and pollinator gardens. Students participate directly in habitat restoration, learning the critical role that nature plays in our food system. Having directly supported local biodiversity, students learn valuable lessons in science, math and nutrition. CAN!’s ecological restoration goal is to remove 100,000 ft2 of cement and asphalt in San Francisco by the year 2020. To date CAN! has successfully removed (and subsequently cultivated) 13,500 ft2 of hardscapes, building organic food and flower gardens for students, neighbors and pollinators all in the public right-of-way. Last year at seven distinct SFUSD school sites the CAN! Pollinator Garden Project culminated with the planting of 90 fruit trees and 500+ perennial plants after the removal of 7,250 ft2 of cement. This year’s CAN! Pollinator Garden Project will remove an additional 5,000 ft2 of cement at three new CAN! partner K-12 schools throughout San Francisco. Youth participation and engagement in plant selection, garden design, installation, maintenance and subsequential harvests of organic fruits and vegetables will occur with a focus on STEAM curriculum enhancement. With a reach into three additional CAN! partner schools, the CAN! Youth Ecological Stewards Program will engage, educate and empower over 2,500 San Francisco middle and high school students. CAN! teaches California Next Generation Science standards-based lessons about water cycles, resource conservation, understanding watersheds and organic horticulture in the outdoor classroom. Partnering with teachers, parents and the larger community the CAN! Youth Ecological Stewards Program will promote direct youth participation in drought awareness and ecological restoration. 450 lessons will be taught in the 2015-2016 school year. Employing 10 neighborhood teens, the CAN! Bayview Watershed Project removes 4,500 ft2 of cement from privately owned sidewalks in the Bayview neighborhood in southeast San Francisco. 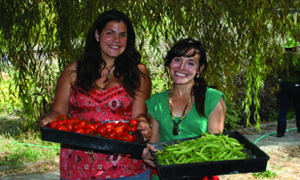 Partnering with the Northridge CommUNITY Garden, youth interns perform the door-to-door outreach necessary to recruit interested neighbors building corridors of valuable habitat that sequester carbon dioxide, reduce pressure on the City’s combined sewer system while building community and green space in the Bayview. Click here to donate to Climate Action Now!